Concrete has been used in construction in the modern construction industry for more than a century. Consisting of fine aggregate (sand), coarse aggregate (gravel and crushed stone), cement, and water, and in some cases augmented by chemical additives to increase durability and flowability of the material, concrete is prevalent in society. Visual assessment of a concrete structure. With reinforcing steel added for tensile strength, and the ongoing development of new admixtures and additives, the possibilities of concrete construction appear limited only by the creativity of the designer. Concrete, similar to other construction materials, deteriorates over time and with exposure to environmental factors or due to structural issues. Primary causes of deterioration of concrete are typically related to corrosion of embedded metal, materials problems, or associated with original construction. 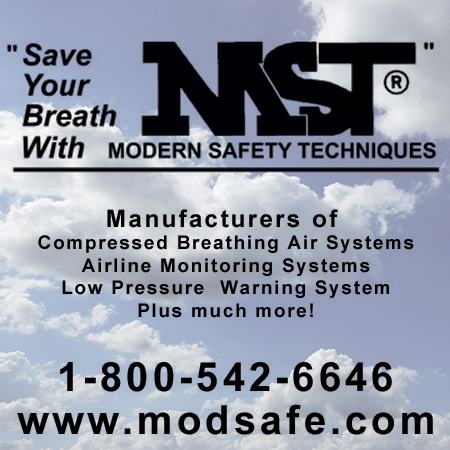 The nature and severity of each type of deterioration depends upon the climate and other conditions of exposure. An assessment of a concrete structure to evaluate existing conditions and determine causes of distress and deterioration provides the basis for development of a repair program. The first step in an assessment is to review relevant available documents. Drawings are often available for review, and in some instances construction-related documents such as specifications, field reports and submittals may also be available. Valuable information can also be found in documentation from previous investigations and prior repair work, as well as through interviews with the owner and maintenance staff. The next step is the field investigation, which includes verifying information obtained during the document review by comparison with as-built construction, and performing a visual condition survey of the structure. 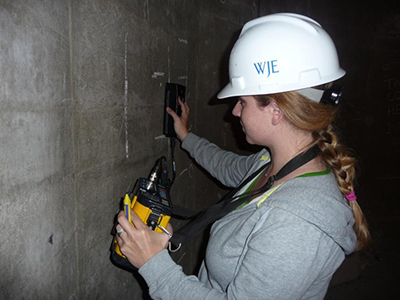 Sounding and observation of deterioration at an existing concrete structure. The investigation typically includes visual observation, documentation and measurement of elements of interest. 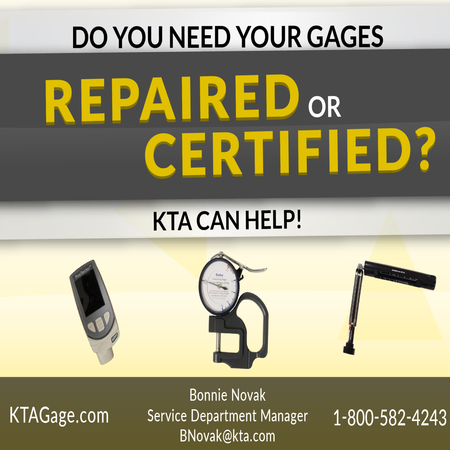 Previous modifications or repairs should be assessed as part of the field work. The condition survey is the most important part of the field investigation because it is the basis for decisions and further analysis, as well as for development of a repair approach. Documentation of observed deterioration (e.g., spalling, cracking, etc.) typically includes annotations on plans or elevations to indicate locations and sizes of observed deterioration and distress, notes and photographs. Concrete cracking is not an unusual condition; however, the investigation and documentation of existing cracking will provide information regarding why the cracking occurred. The use and exposure of the structure should also be documented. For example, as chlorides can induce corrosion of the reinforcement, it is important to note any potential external chloride sources; these sources may include salts used on adjacent sidewalks or driving surfaces in the winter to reduce snow and ice. 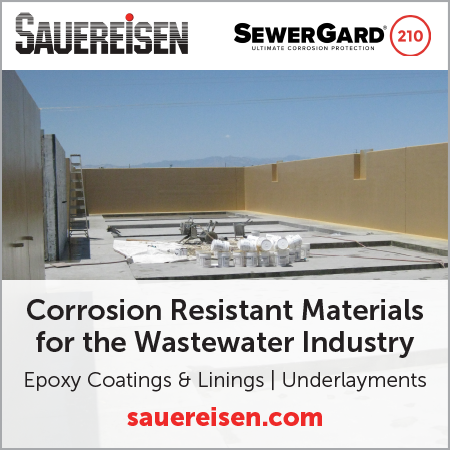 In the case of reinforced concrete, concealed conditions such as corrosion of embedded reinforcement bars contribute to concrete deterioration; therefore, testing and inspection openings are often required. To confirm and augment the findings of the visual investigation, many projects also involve nondestructive testing, inspection openings and laboratory analysis. Use of nondestructive testing to determine location of reinforcement steel during an assessment of a concrete structure. Nondestructive testing can provide information regarding the location of reinforcement as well as the extent of distress. 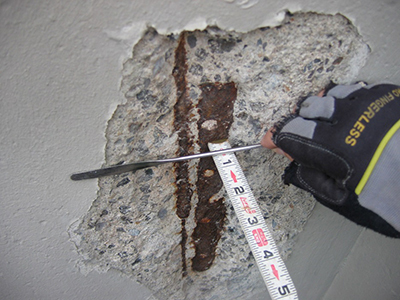 The most common type of nondestructive testing is sounding, which involves tapping the concrete surface with a hammer or dragging a chain across a horizontal surface; an experienced investigator can use these techniques to identify areas of delaminated and unsound concrete. 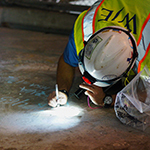 Ground-penetrating radar (GPR) or use of a covermeter (also known as a pachometer) are also commonly used nondestructive testing techniques for concrete structure assessments. These techniques are used to determine as-built conditions such as dimensions when only one side of the concrete element is accessible, location of reinforcement, and location of other embedded or encased items. 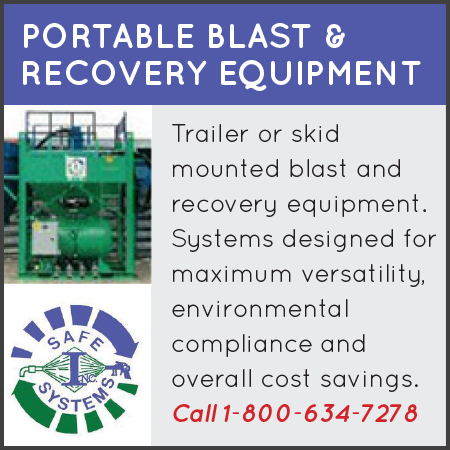 Selected exploratory openings are necessary to confirm results from nondestructive testing. 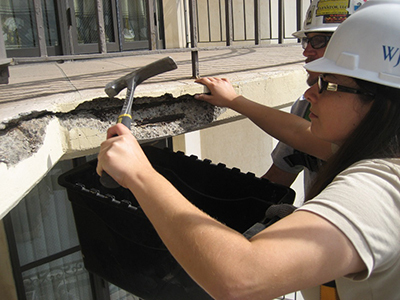 As conditions that contribute to deterioration and distress within concrete structures are often not visible, the use of inspection openings is an important part of the assessment. Locations for inspection openings should be representative of conditions noted during the survey but should also be unobtrusive. Documentation of the size of reinforcement as well as the thickness of the concrete cover over the reinforcement at representative locations can be determined with small inspection openings or with concrete material sample removals. In some cases, locations of existing or incipient spalls provide an opportunity to examine concealed conditions. Documentation of existing conditions at a spall location. Note corrosion of embedded elements. Samples, typically small diameter (2 to 4 inches) cores, are often removed from representative locations on the structure for laboratory testing. Laboratory testing can provide information regarding the strength of the concrete as well as material and concrete constituent information. Petrography, the detailed analysis and study of concrete using stereomicroscopy, provides valuable information regarding concrete composition, concrete mix design and the potential causes of observed distress. 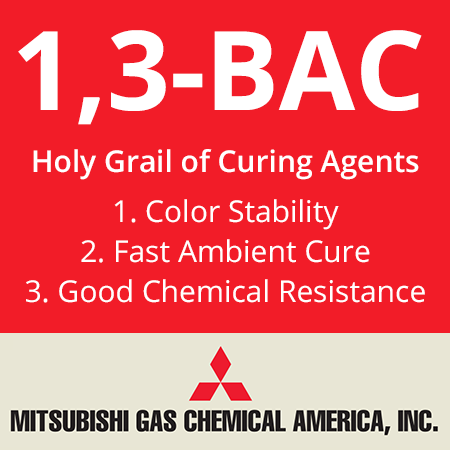 Additional laboratory testing, including chemical analysis, can determine the chloride content of the concrete, compressive strength, and specific constituents of the concrete. Information gathered through materials studies not only helps identify causes of distress, but also assists in development of repairs. The findings from document review, field investigation and testing are studied to determine the underlying causes of observed deterioration and distress. 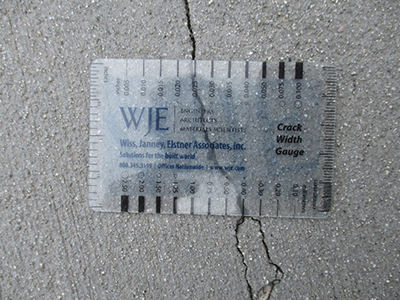 Measurement of existing crack with a crack gauge. By comparing the results of the assessment performed, the cause(s) of the deterioration can be determined. 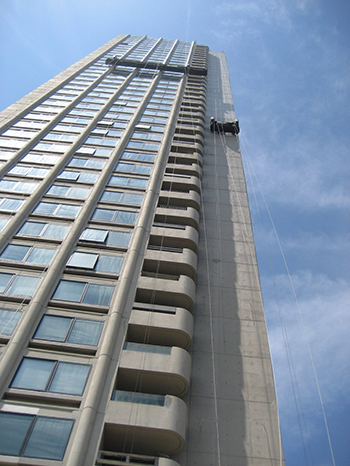 In some cases, structural assessment and analysis may be necessary, for example, if as-built conditions are found to be different than anticipated (e.g., less reinforcement in the structure). The cause(s) of the deterioration and distress must be understood in order to develop the appropriate scope and extent of repairs. The evaluation typically concludes with the preparation of a report for the owner summarizing the findings of the assessment and recommendations for repair and for further investigation as required. 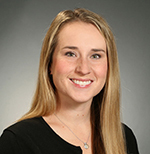 Ann Harrer is a senior associate at Wiss, Janney, Elstner Associates. She has broad-based experience with the assessment of existing building facades, historic preservation, materials testing and field inspections. She has been involved with the investigation of and restoration of historic and architecturally significant structures. Harrer has experience with different building materials including brick, terra cotta, marble, limestone, cast stone, as well as concrete building facade and structural elements. You can reach Ann at aharrer@wje.com.